Shell Me the Way! (or World 3-3) is the third level of World 3 and the eleventh level overall in Super Mario Run. Its name is a pun on the phrase "show me the way". The level starts with a single red Koopa Troopa patrolling a row of Brick Blocks. Hitting it from below allows the player to kick it, breaking a section of Brick Blocks up ahead to allow access to the Super Mushroom. Immediately after, the first Pink Coin can be seen, and the player needs to bounce off of two Goombas to get it. 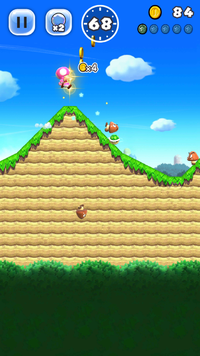 A few green Koopa Troopas appear, followed by a higher row of Brick Blocks, which lead the player to the second Pink Coin. A Trampoline appears, along with another green Koopa Troopa that can be kicked into other enemies. Afterwards, a Pause Block appears, along with a Koopa Paratroopa. The player must bounce off of the Koopa Paratroopa to get the third Pink Coin. The player must then simply follow the shell's movement, as it breaks a few Brick Blocks and automatically collects the fourth Pink Coin. (The player can also utilize a green Koopa Troopa.) Afterwards, the player will encounter yellow arrow blocks that they can jump off of to get onto a row of stone blocks. They must follow the row of stone blocks, then jump onto a row of Brick Blocks, then another row, then another to get the fifth and final Pink Coin. After a while, the player will encounter a Super Star inside an area of Brick Blocks. They can then use that Super Star to get past the Munchers in the area. Afterwards are some platforms leading to the Goal Pole. The level starts with a single red Koopa Troopa patrolling a row of Brick Blocks. Hitting it from below allows the player to kick it, breaking a section of Brick Blocks up ahead to allow access to a ? Block containing the first Purple Coin. The player can then utilize a green Koopa Troopa, and follow it for quite a distance before dropping down to a lower level to get the second Purple Coin. After crossing a green warp pipe, a Trampoline appears, along with another green Koopa Troopa that can be kicked into other enemies. Afterwards, a Pause Block appears, along with a Koopa Paratroopa. The player must bounce off of the Koopa Paratroopa to kick it into some Brick Blocks and get the third Purple Coin. Immediately after, the player can kick a green Koopa Troopa into an area full of Brick Blocks, although they must wait at the Pause Block so that the shell can hit the ? Block containing the fourth Purple Coin. Before long, a Red Ring appears, and the player must use the yellow arrow blocks to collect all Red Coins and collect a Super Star. The player must then wall jump through an area full of Brick Blocks and collect the fifth and final Purple Coin. They can then use that Super Star to get past the Munchers in the area. Afterwards are some platforms leading to the Goal Pole. The level starts with a single red Koopa Troopa patrolling a row of Hard Blocks. Hitting it from below allows the player to kick it, breaking a section of Brick Blocks up ahead to allow access to the Super Mushroom. Immediately afterwards, there is another red Koopa Troopa that the player can kick, and once it rebounds, the player can jump off of it to get the first Black Coin. Afterwards, the player can kick a green Koopa Troopa. They must then long jump on the yellow arrow blocks, bounce off of another enemy, bounce off of one of the Goombas on the Spike Traps, and then long jump again to get the second Black Coin. A Trampoline appears, along with another green Koopa Troopa that can be kicked into other enemies. Afterwards, a Pause Block appears, along with three Koopa Paratroopas. The player must bounce off of all three Koopa Paratroopas to get the third Black Coin. The player must then kick a green Koopa Troopa on a higher ledge, then use a Trampoline, then use a Pause Block to wait until the shell breaks a Brick Block blocking access to the fourth Black Coin. After collecting that coin, the player must kick yet another green Koopa Troopa, and follow it until it breaks some Brick Blocks. They must then jump to collect the fifth and final Black Coin, along with a Super Star. They can then use that Super Star to get past the Munchers in the area. Afterwards are some platforms leading to the Goal Pole. French Suivez ces carapaces ! German Bahn frei mit Panzerkicks! Gogo! Gubook kick! Go go! Turtle Kick! Go! Go! Tī guī ké! Go! Go! Kick the Turtle Shells! This page was last edited on October 7, 2018, at 14:51.